Johannes Lebek (19011985) studierte nach autodidaktischen Anfängen und privatem Kunstunterricht von 1931 bis 1934 an der Staatlichen Akademie für graphische Künste und Buchgewerbe in Leipzig. Ab 1954 arbeitete er an seiner einstigen Ausbildungsstätte, der heutigen Hochschule für Grafik und Buchkunst Leipzig. Dort wurde er Leiter der Holzschnittwerkstatt und Lehrer für Naturstudium. Aus ideologischen Gründen wurde er 1958 entlassen. Von 1918 bis 1968 lebte und arbeitete Johannes Lebek in Zeitz. Er war mit dem kulturellen Leben dieser Stadt auf vielfältige Weise verbunden. Zahlreiche Arbeiten zeigen Motive seiner Heimatstadt Zeitz und deren näherer Umgebung. Künstlerisch geprägt durch genaues Studium der Natur und der Beobachtung der menschlichen Lebens- und Arbeitswelt entstand ein umfangreiches Werk aus Holzschnitten und Holzstichen, Aquarellen und Zeichnungen. Kontakt | Zeitz | Kunst- und Museumspädagogisches Zentrum „Johannes Lebek"
The Stanford University Libraries, Department of Special Collections, is pleased to announce the exhibition Johannes Lebek: The Artist As a Witness of His Time. This event celebrates the work of Lebek (1901-1985), a renowned master of the woodcut and one of Germany's finest, although lesser-known, 20th-century illustrators. With an emphasis on documenting the artist's life and production, the exhibition will feature prints, illustrated books, photographs, sketchbooks, and manuscript material. Curated by Elisabeth Wegner, tLebek: The Artist As a Witness of His Time will be on view at Stanford University's Cecil H. Green Library, Peterson Gallery, second floor of the Bing Wing . The exhibition is free and open to the public. Born in Zeitz, Germany, in 1901 to working class parents, Lebek was a prolific artist working in the Northern Romantic tradition whose emerging sensibilities were influenced by his country's strong graphic arts traditions and the rise of German Expressionism. 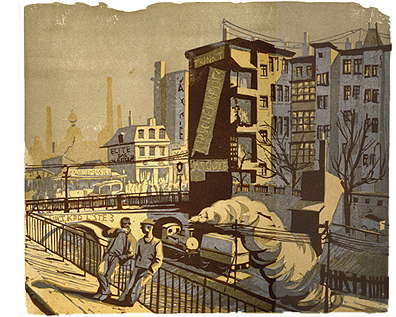 Despite experiencing the turmoil of poverty, two world wars, and life under the Weimar Republic and the Third Reich, Lebek's illustrious career as an artist began with studies at the prestigious Leipzig Academie f¸r graphische K¸nste und Buchgewerbe (Academy for the Graphic Arts and Book Production) under the direction of German woodcut and engraving master Hans Alexander Mueller. Lebek became a woodcut instructor at the Academie in the 1950s, and he, along with colleague Frans Masereel, was a founding member of the Xylon International Society of Wood Engravers. In 1969 he emigrated to Adelebsen, West Germany, and began a new phase of vigorous productivity. By the time of his death in 1985, Lebek was credited with supporting a revival of the woodcut medium in Leipzig in the 1960s and 1970s. He had produced single prints, topical cycles and portfolios of prints, children's books, an important woodcut primer, and illustrations to books-including several literary classics-by approximately fifty authors.